This Irish blessing plaque features a leprechaun and shamrocks. This Irish blessing plaque features the following verse: Wherever you go and whatever you do, may the luck of the Irish be there with you. 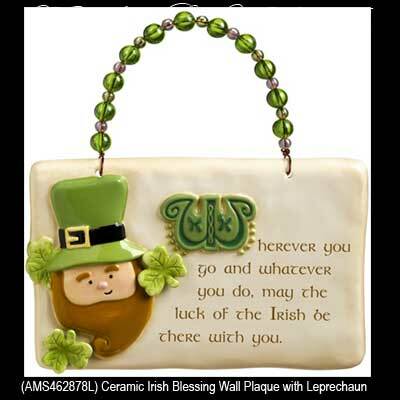 This wall plaque features an Irish blessing that is enhanced with a leprechaun and shamrocks. The ceramic Irish blessing plaque has a raised dimensional design that measures 6" wide x 4" tall, not including the beaded wire hanger. The Irish wall plaque is gift boxed with a shamrock history card that is complements of The Irish Gift House.